The dance company, founded in 1987, is co-directed by Karl Schaffer and Erik Stern, and tours internationally. Our long-time collaborators have included Gregg Lizenbery, Scott Kim, and Chris Jones, along with long-time performer Saki. Dr. Schaffer and Mr. Stern has received funding from the National Endowment for the Arts, the California Arts Council, the Cultural Council of Santa Cruz County, and the Community Foundation of Santa Cruz County. See the October, 2012 TEDx presentation by Karl Schaffer and Erik Stern on our educational approach to combining dance and mathematics. Here are Video excerpts of Dr. Schaffer and Mr. Stern Dance Ensemble works. Our book Math Dance is available here. 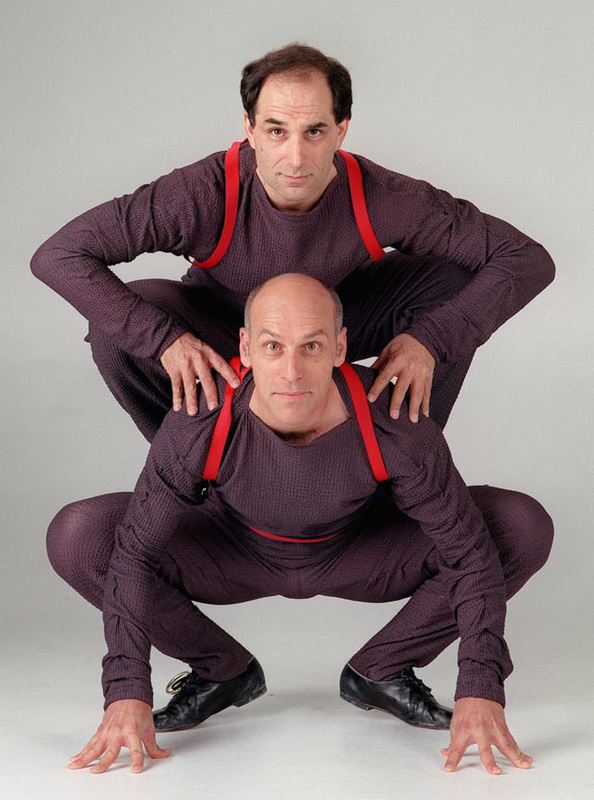 Karl Schaffer and Erik Stern are on the Teaching Artist Roster of the Kennedy Center for the Performing Arts Partners in Education program, and frequently travel nationally and internationally to give presentations on dance and mathematics. Fri., Apr. 12, Montalvo Arts Center presents Karl's dance concert Mosaic at 9:30 AM and 11:30 AM. Fri., Apr. 5, 8 PM, Storm, a concert on a “perfect storm” of political themes: violence, war and peace, environment, and equity, with a special focus on the Middle East, by Karl Schaffer, performing at the Dancenter in Capitola, with dancers Maria Basile, Mercedes Johnson, Jane Real, Laurel Shastri, Lila Salhov, and Michelle Voorhees. Seating is limited, buy tickets in advance here, more info here. Sat., Feb. 23, Karl teaches a "Dance, Rhythm, and Math" workshop at the Monterey Bay Area Math Project's STEAM conference at UCSC. MoveSpeakSpin dancer Laurel Shastri also teaches her "The Scientific Dancer" workshop. Jan. 16-19, Karl presents a minicourse on Mathematics and Dance on Thursday and Saturday at the Joint Mathematics Meetings 2019 in Baltimore. He also presents a short talk on 3-dimensional symmetries in dance and other movement arts. Tue., Jan. 8, 5-8 PM, at San Jose State University and again on Thu., Jan. 10, 5-8 PM, at Stanford University, Karl presents "Moving with Symmetry" workshops for the Bay Area Math Teachers' Circles. Sat., Dec. 1, Karl presents "Let's Get Loopy with Geometry," developed with Erik Stern, at the California Math Council's Asilomar Conference in Pacific Grove. Thu., Nov. 15, Karl presents a guest lecture on symmetry, mathematics and dance for Kathie Kratochvil's Univ. of Calif. Santa Cruz class, "The Arts in Schools: Aesthetic Education Theory and Practice." Nov. 14-16, at the Univ. of Newcastle in Australia, Erik and Rachel Bachman present a workshop and public lecture on mathematics and dance at the AMSI/AustMS Workshop on Mathematical Thinking. Fri., Nov. 2, Karl presents a workshop on rhythm and dance at the Marion Cilker Conference for the Arts in Education at San Jose State University. Oct. 28-29, Karl presents a workshop on Moving with Symmetry at the California STEAM Symposium in Long Beach, California. Oct. 13, Erik and Karl return to Fresno to complete their Math Moves residency with the Fresno County Office of Education and the Fresno Arts Council. More info here. July 25-29, Karl gives talk on Center of Attention in Dance, joint work with Joseph Thie and Kasia Williams at the Bridges Stockholm 2018 conference; and presents a Family Day activity on string, straw, and finger polyhedra. Wed., July 11, 4 PM and 7 PM, Karl gives presentation at the National Museum of Mathematics (MoMath) in New York City as part of their Math Encounters series. More info. Tues., July 3 and Thu., July 5, Karl's show Pitter Pattern performs at Freedom Elementary and Anna Soldo Elementary in Watsonville, with Jane Real, Saki, and Laurel Shastri. Sponsored by the Arts Council of Santa Cruz County and Pajaro Valley Unified School District. Mon.- Wed., June 18-20, Karl and Erik teach Math Moves: Connecting Math and Dance in the Classroom for the Fresno County Office of Education and the Fresno Arts Council. More info here. Mon. - Fri., June 11-15, Erik Stern and Rachel Bachman conduct "Math + Dance: Physical Problem Solving Methods" at Weber State Univ.. A WSU sponsored week-long intensive introduction for middle and secondary mathematics teachers to the use of physical problem solving to teach mathematical concets, drawing on the work of Karl Schaffer, Erik Stern, Rachel Bachman, and Julian Chan.More info here. Mon.-Tue., June 11-12, Karl teaches Physical Problem Solving: Math Dance workshops in Tallahassee for Opening Nights Performing Arts at Florida State Univ. and Leon County Schools. Mon.-Tue., June 4-5, Karl teaches workshops on rhythm, symmetry, and loopy geometry for elementary and middle school teachers in Las Vegas for the Confabulation conference of the Smith Center for the Performing Arts and the Clark County School District. April 2-6, Karl does class visits in Massachusetts to lead math/dance activities at Wheelock College (in Boston, Apr. 2), Worcester State Univ. (Apr 4), and Westfield State Univ. (Apr. 5-6), hosted by faculty Deborah Borkovitz, Maria Fung, and Christine von Renesse. Tues., Mar. 27, 6-8 PM, Karl gives a presentation entitled "Calculated Movements," on how mathematics and dance inspire each other. The talk will be accompanied by performance excerpts, audience interactions, and entertaining visuals, as part of Montalvo Arts Center's new lecture series. More info and tickets. March 12 & 13 Erik conducts a one-day residency at Utah State University, through the Beverly Taylor Sorenson Arts Learning program, including a workshop for teachers and education students, and two demonstration classes for 4th grade. More info here. Mon. Feb. 12, Karl gives presentation on choreographing as a tool for social justice to the Teaching Artist Gathering of the Arts Council Santa Cruz Countyl, meeting in Watsonville. Thu., Feb. 8, Karl gives workshops on symmetry and rhythm at the Synapse School Math Circle in Menlo Park. Fri., Jan. 12, Karl gives presentations at the Joint Math Meetings in San Diego on the Center of Attention in Dance (joint work with Joseph Thie and Kasia Williams), and on the the Truncated Octahedron in Dance, Art, and Music (with Debra Borkovitz). Tue., Nov. 21, Math Colloquium: Weber State University, Professor Erik Stern. "Expressions of Pattern." How does reasoning express itself in fields that aren’t symbol focused? How can connecting the artistic and mathematical help overcome preconceptions that one is only creative and the other only procedural? Aug. 21-25, Erik teaches Dance + Math workshops in Grande Prairie, Canada sponsored by Thinking 101. The activities connect universal elements of movement and mathematics. July 27-31 and Aug. 6-8, Karl gives presentations at the Bridges Math and Arts conference in Waterloo on dichromatic or 2-color symmetry in dance and at the National Museum of Mathematics MOVES conference in NYC on "Edgy Puzzles," derived from dances with PVC pipe sections manipulated to form various geometric shapes. He leads string polyhedra activities at both conferences. Mon.-Wed., June 5-7, Erik and Rachel Bachman (Erik's Weber State University colleague from Math Education), co-teach as part of a three-day mathematics workshop for secondary math teachers. Building on both Karl's and Erik's work, the math dance portion of the Concurrent Enrollment Summer Conference, presented by WSU's Center for Science and Math Education, also draws on Erik and math colleague Julian Chan's new movement-math lessons for their WSU general education course Pattern Play, Movement & Mathematics. Wed., Jun. 14, Karl gives a LASER talk (Leonardo Art/Science Evening Rendezvous) at UC Berkeley, 7 PM, more info, on the many ways math and dance may connect. Wed., May 31 and Thu., Jun. 1, Karl and Erik teach professional development math/dance workshops in Phoenix for the Kennedy Center Partners in Education teams from the Paradise Valley and Scottsdale Unified School Districts. Fri., May 26, MoveSpeakSpin dancers perform Karl's new mathematical dance show Pitter Pattern at Green Acres Elementary School in Santa Cruz. Sun., May 7 and Sun., May 14, 5:30 PM, Karl's concert Choreocopia, a celebration of food, song, and dance, in collaboration with Zambra women's world music choral ensemble and master chef Jozseph Schultz premeires at the 418 Project in Santa Cruz, California. Tickets - because this is a custom dinner event, tickets must be purchased at least two days prior to the show. More info. Wed., Mar. 22, 4-6 PM, Karl gives two hour teacher workshop "Dancing with Mathematics: Exploring Symmetry and Rhythm" at the Montalvo Arts Center in Los Gatos, California. Wed,. Feb. 15, 7-9 PM, Karl gives workshop, "Polyhedra on a Shoestring" for the San Jose Math Circle at San Jose State Univ. Wed., Jan. 4, Karl gives presentation "Dichromatic Dances" on two-colored symmetry patterns in dance at the Joint Mathematics Meetings 2017 conference in Atlanta. Dec. 12-13, Karl and Erik give two three-hour math dance workshops for teachers and accompanying demonstration classes in local schools for the Scottsdale Center for the Performing Arts, the Paradise Valley Unified School District, and the Scottsdale Unified School District. Sat., Dec. 3, Karl gives presentation "Rhythm and Dance Math" at the California Math Council - North conference at Asilomar in Pacific Grove, California. Nov. 17-18, Karl gives three-hour math dance teacher workshop and demonstration classes in four elementary schools for Johnson County Community College Performing Arts Series and Shawnee Mission School District in Shawnee Mission, Kansas. Nov. 12, Erik writes and delivers narration to Weber State Univ. Orchestra Tribute to Broadway and performs a short tap sequence. Oct. 22, Erik and Rachel Bachman present “Dancing and Mathing – An Integrative Approach” at the 2016 School Science and Mathematics Association Convention in Phoenix as part of the featured Saturday Innovations Showcase. Oct. 7, Erik and Adam Johnson present "DanceScienceFest - A Body in Motion: A workshop based on a Dance Physics Higher Ed Project" at the National Dance Education Organization 2016 National Meeting in Arlington, Virginia. Oct. 1, Erik gives presentation on Weber State Univ. course Pattern Play: Movement and Mathematics at the Association for General and Liberal Studies in Salt Lake City. Sep. 19, Erik and Daniel Jonas premiere "Sound Bites," a tap-trumpet duet which is also a reflection on the political sound bite in Jonas' faculty jazz concert at Weber State University Austad Auditorium. Aug. 9, Erik and Julian Chan present a 90 minute movement-based workshop “Putting Your Best Foot Forward: Movement and Mathematics in College,” on arts as a paradigm for mathematics learning at Bridges Finland 2016 conference. Mon., June 20 to Wed., June 22, Erik, Rachel Bachman, and Saki teach three days of math and dance workshop activities to teachers at the Peace Center in Greenille, Souith Carolina. Sat., Apr. 30, Karl Schaffer along with Maria Basile, Jane Real, Frankie Rivera, and Lila Salov perform several dances from Karl's concert Mosaic at the Friends of Sabeel conference at Peace United Church of Christ in Santa Cruz. FOSNA is a Christian ecumenical organization seeking justice and peace in the Holy Land through non-violence and education. Fri., Mar. 18, NBC Nightly News spent the day interviewing and filming Karl and Erik teaching a math dance activity to Kulani Kamahao's 5th grade class at Amesti School in Watsonville. Reporter Rehema Ellis and producer Jackeline Pou flew in from the east coast to create the story - though it has not aired. Mon., Mar. 7, Erik teaches a math/dance workshop for teachers at the Flynn Center for the Performing Arts in Burlington, Vermont, 4-6 PM. Feb. 27, Erik and Rachel Bachman present movement workshop “Math Dance: A Study of Effectiveness” at Research Council on Mathematics Learning conference in Orlando, based on interdisciplinary general education course Pattern Play: Movement and Mathematics, which satisfies both the Weber State Univ. Quantitative Literacy and Creative Arts requirements. Fri., Feb. 26, Karl's concert The Daughters of Hypatia: Circles of Mathematical Women performs two shows at Green Acres Elementary School in Santa Cruz. Wed., Th., Jan. 13-14, Karl teaches math dance workshops for teachers and students in Hartford for for Kennedy Center Partners in Education affiliate Hartford Performs and local S.A.N.D. school. Sat. Jan. 9, Joint Math Meetings of the Math Assoc. Amer. and Amer. Math. Soc. in Seattle. Karl Schaffer gives a talk on his recent math/dance polyhedra-related work. January 8, 4-6pm, Association of Science Teacher Education International Conference, Peppermill Hotel Casino, Reno, Nevada. Erik and Adam Johnston lead session, "Science and Dance - An Experiential Workshop: A Body in Motion." Sat., Dec. 12, Karl gives presentation on math and dance at the annual California Math Council North conference at Asilomar in Pacific Grove. November 20 & December 4, Stansbury Elementary, Salt Lake City. Erik and Adam Johnston conduct demonstration classes for 6th grade classes on physics and dance, "DanceScienceFest - A Body in Motion"
Fri., Nov. 13, Karl teaches a workshop on symmetry for prospective teachers at the Marion Cilker Conference for the Arts in Education in San Jose, CA. November 3 & 10, Stansbury Elementary, Salt Lake City. Erik and Adam Johnston conduct teacher workshops on physics and dance, "DanceScienceFest - A Body in Motion"
Sun., Nov. 1, Celebration of Mind at Stanford University. Karl and Scott Kim, with assistance of Laurel Shastri, give a presentation on "Clapping Games" for this annual event celebrating the work and colleagues of Martin Gardner. Oct. 22-24, Karl's concert The Daughters of Hypatia performs at the Alys Stephens Center for the Performing Arts in Birminghhma, Alabama, as part of their ArtPlay program. Saki, Lila Salhov, Jane Real, and Laurel Shastri give five performances of this concert celebrating women mathematicians throughout history, and Karl teaches workshops for teachers, Univ. of Ala. students, and a local school. A Celebration of Mind event with mathematical puzzles and games will be held in the theatre lobby prior to the Saturday 2 PM performance. Video highlights of Hypatia. Oct. 15-16, Erik teaches math dance workshops for teachers and students in Santa Clarita, CA for for Kennedy Center Partners in Education affiliates Santa Clarita Performing Arts Center and several local school districts. Sep. 9-11, Karl and Erik teach math dance workshops for teachers and students in Peoria, Arizona for Kennedy Center Partners in Education affiliates Arizona State Univ. Gammage, Mesa Public Schools, and Peoria Unified School District. Sep. 2-4, Karl Schaffer teaches math dance workshops for teachers and students in Tyler, Texas for for Kennedy Center Partners in Education affiliates Young Audiences of Northeast Texas and the Tyler Independent School District. Bridges Math and Arts conference, Baltimore, July 29-Aug. 1. Museum of Math MOVES conference, NYC, Aug. 2-4. Math Assoc. America MATHFEST, Washington DC, Aug. 5-8. June 30 - July 29, Karl spends a month at the Djerassi Resident Arts Program in Woodside, CA, as one of 12 artist/scientists selected from 240 applicants for the "Scientific Delirium Madness" project bringing the arts and sciences together. Laurel Shastri is also resident as dancer working with Karl. Karl, Saki, and Laurel perform at the annual Djerassi open house on Sunday, July 19. Erik and Karl did a month-long Djerassi residency in 1999. Thursday, April 30, 1:30 PM, Karl's concert The Daughters of Hypatia performs at the De Anza College Visual and Performing Arts Center, free admission. More info and background. Sponsored by De Anza College Women's History Events and DASB, Developmental and Readiness Education, Institute of Community and Civic Engagement, and Math Dept. Fall 2014-Spring 2015, Erik Stern collaborates with Weber State University science education faculty Adam Johnston on Stern's year-long Moving Company outreach project "Dance Science Fest - A Body in Motion." Working with 13 students, Dance Science Fest rehearses all year to create a show which performs March 30, 31 and April 1 for thousands of Northern Utah 4-12 students in WSU's Browning Center. Friday/Saturday, March 20-21, Karl and Erik teach workshops and give a keynote presentation for the joint North Dakota Council of Teachers of Mathematics and North Dakota Science Teachers Association conference "Steam Ahead" in Bismarck. Friday, March 13, De Anza College, Karl teaches a workshop on math and dance at the annual De Anza College Partners in Learning Conference. Monday, Mar. 2, in Lancaster, California, Karl gives a workshop on math and dance for the Lancaster Performing Arts Center. Saturday, Feb. 7 at 8 PM and Sunday, Feb. 8, at 3 PM, in Marina, CA, Lila Salhov and Laurel Shastri perform "A Circle Has No Sides," from Karl Schaffer's concert The Daughters of Hypatia in the Spector Dance Choreographer's Showcase. See flyer. Saturday, Jan. 24, Karl teaches a workshop on dance and symmetry as part of the Monterey Bay Area Math project's 2015 Winter Conference for K-12 Teachers. Fri., Nov. 21, Karl teaches a workshop for prospective teachers at the Marion Cilker Conference for the Arts in Education in San Jose. Fri., Nov. 7, Karl's concert The Daughters of Hypatia performs at Green Acres School in Santa Cruz through the SPECTRA program, and then on Sat., Nov. 8 in Fresno at the Sonia Kovalesky Mathematics Day, a mathematics festival for female high school students interested in mathematics. More info: description of the performance, flyer (2 pages, 10 Mb), audience responses. Thu., Nov. 13, Karl and Erik teach workshops for students and teachers in Appleton, Wisconsin, sponsored by the Fox Cities Performing Arts Center and the Appleton Area School District. Fri., Nov. 14, Karl teaches workshops for teachers in Rockford, Illinois, sponsored by the Rockford Area Arts Council and Rockford Public School District #205. Oct. 30 and Dec. 4, 75 high school students from Salt Lake Center for Science Education join Moving Company at WSU for a movement based physics class. Fri., Oct. 17, Karl and dancers will do onsite performance and audience participation, as part of the Santa Cruz Museum of Art and History's GLOW: A Festival of Light event. Karl is one of the museum's Participatory Performing Artists in Residence (PPAIR) for 2014, and this work highlights video tessellation software by Kevin Lee. Advance tickets available here. Fri./Sat. Oct. 3/4, Karl gives talks on mathematics and dance and workshops on string polyhedra at the first MoSAIC festival at Berkeley City College. MoSAIC, Mathematics of Science, Art, Industry, Culture, is a series of regional festivals based on the Bridges Math and the Arts conferences. Here are video directions for the string polyhedra we made in the workshops, with other short related videos. Fall 2014, Erik Stern - along with Julian Chan and Rachel Bachmann from the Mathematics Department at Weber State University - teaches "Pattern Play: Mathematics and the Creative Arts." Combining a contemporary mathematics course with an Honors Program course, this six credit class draws on Karl and Erik's longstanding work, and also introduces new activities. Assessment of the outcomes are being done and will be submitted to publications. Aug. 14-19, 2014, Erik, Karl, and Saki perform at Bridges Seoul 2014, an international conference on math and the arts. Performances will be Saturday, Aug. 16 and Sunday Aug. 17 at the Gwacheon National Science Museum in Seoul, Korea. Monday, Aug. 4, Karl teaches a workshop on math and dance to students at SUMaC, the Stanford University Mathematics Camp. Monday, Aug. 11, 2014, Erik and Karl teach an all day workshop on math and dance for teachers at the Eagleview Middle School in Colorado Springs. Thursday, June 26. Karl Schaffer gives a workshop on "Dance and Geometry" for the Monterey Bay Area Math Project's Summer Institute. 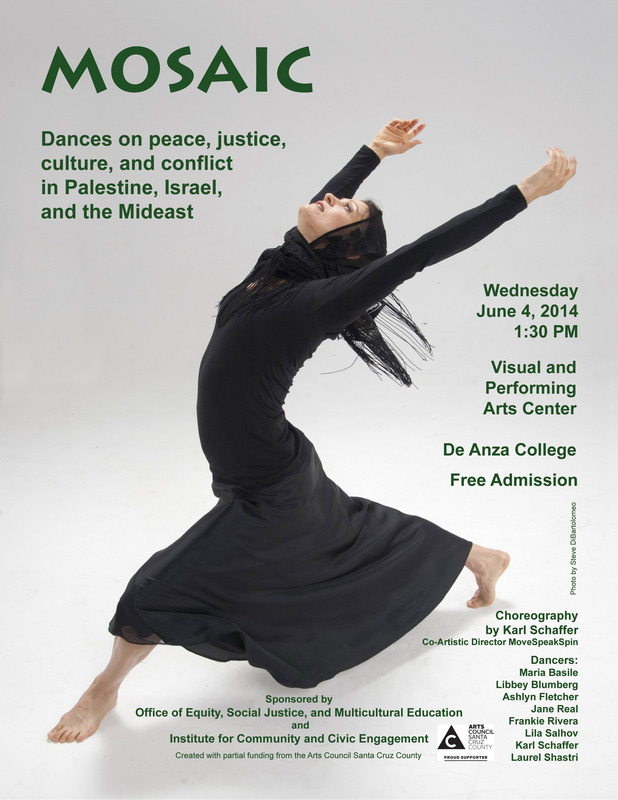 Wed., June 4th: Mosaic: Dances of Peace, Justice, Culture and Conflict in the Middle East, choreographed and directed by Karl Schaffer, performs Wednesday, June 4th, 2014 at 1:30 PM at the Visual and Performing Arts Center at De Anza College, sponsored by the De Anza Institute for Community and Civic Engagement and the Office of Equity, Social Justice, and Multicultural Education. interviews about Mosaic in the Santa Cruz Sentinel, the Good Times. Choreographed and directed by Karl Schaffer, performed at West End Studio Theatre, April 7-13, with five school matinee performances and four public performances. This show celebrates great women mathematicians throughout history. Mar. 28, 2014. Erik Stern did a keynote presentation at a Weber State Univ. Arts Integration Conference, March 28 on "Creative and Critical Thinking: An Active Arts Learning Approach." Feb. 7/8, 2014 Showcase performances: Maria Basile performed Karl Schaffer's "The Mourning After" from Mosaic at the sjDanceco showcase Fri/Sat Feb. 7/8. Jane Real, Saki, and Lila Salhov performed "Trio for Six," part of the upcoming Daughters of Hypatia show, at the SpectorDance showcase Sat., Feb. 8: review. 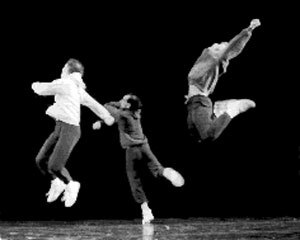 "Trio for Six" was originally choreographed by Karl, Scott Kim, and Barbara Susco. Mosaic: Dances of Peace, Justice, Culture and Conflict in the Middle East, choreographed and directed by Karl Schaffer, was performed Sunday, Dec. 1 at 10:30 AM in the PEACE UNITED CHURCH OF CHRIST (formerly the First Congregational Church in Santa Cruz). Dr. Schaffer and Mr. Stern Dance Ensemble performed and taught on the East Coast during September and October, 2013, see links below. Sat., Oct. 26, Karl and Erik gave a 2-part workshop at the National Dance Education Organization conference in Miami. Tue., Oct. 22, Performance at Univ of Buffalo, 10:30 AM, Mainstage Theatre at the Center for the Arts, Schooltime Adventure Series, University of Buffalo, ticket info: The Secret Life of Squares: The Dance of Math. Note: was originally scheduled for Sep. 24, was rescheduled due to transformer failure at the theater. Mon., Sep. 30 to Fri., Oct. 4, residency at Westfield State Univ., Massachusetts: taught two large workshops for math, dance, and education students, and one math dept. seminar; guest taught four math classes; had numerous meetings with math faculty centered on there Discovering the Art of Mathematics curriculum. Fri. Sep. 27, Museum of Mathematics, Manhattan, 7-8:30 PM, The Secret Life of Squares: Dance Performances and Lecture/Demonstration. Thu., Sep. 26, residency work at Tapestry School, Buffalo. Wed., Sep. 25, workshops and classes at Tapestry School, Buffalo. Sat., Sep. 21, Math Dance Workshop for Educators, SUNY Brockport, registration and more information here. Fri., Sep. 20, math/dance workshops at SUNY Brockport. Thu., Sep. 19, Buffalo State Univ. math/dance workshop, 4-7 PM, registration and info here. Wed., Sep. 18, class and rehearsal at Buffalo State Univ. Article in Proceedings of the National Academy of Sciences by Stephen Ornes, June 25, 2013, on Karl and Erik's math and dance work. Karl Schaffer taught six different math and dance workshops at Create 2013, in Murfreesboro, Tennessee, July 10 and 11, 2013, sponsored by the Tennessee Arts Commission, a math/dance workshop at the New Jersey Performing Arts Center on July 24, 2013, and gave a paper at the Bridges Math and Art Conference in Eschede, Netherlands, July 27-31, 2013. Erik Stern taught a math and dance workshop at the First International Conference on Creative Mathematical Sciences Communication, Aug. 2-5, 2013, in Darwin, Australia. Erik taught a week of math/dance workshops for the Cultural Alliance of Greater Birmingham, in Birmingham, Alabama, during the first week of June, 2013. (1) Article on a Weber State University math dance workshop by Erik Stern, Apr. 20, 2013. (2) Video excerpts of Dr. Schaffer and Mr. Stern Dance Ensemble works. (3) Madison Science Festival, review of performance by Karl Schaffer and Erik Stern, Sep., 2012. (4) Article on Schaffer/Stern workshop at Univ. of Wisconsin Dance Dept., Sep. 28, 2012. (5) Article on Karl Schaffer's Tri-College Mellon Creative Residency: Math and Dance, Sep. 2012. (6) Ohio Council of Teachers of Mathematics Keynote performance, Oct. 18, 2012, Columbus, Ohio. (7) Madison Area Technical College Talk Sep. 28, 2012, by Karl Schaffer. (8) Article by Karl Schaffer and sarah-marie belcastro on math and dance in Best Writing on Mathematics 2012. Donations. Please send donations using our PayPal button or by sending a check/money order to MoveSpeakSpin, PO Box 8055, Santa Cruz, CA 95061, earmarked for fall tour; donations are tax deductible. Concert: Mosaic, Friday and Saturday, June 21 and 22, 2013, at 8 PM, at Motion Pacific in Santa Cruz, Karl Schaffer's dance concert on peace, justice, conflict, and culture, in Palestine, Israel, and the Middle East, including musical perfrmances by Zambra and Fattah Abbou. Articles on the concert in the Santa Cruz Sentinel and Good Times. The Daughters of Hypatia: Circles of Mathematical Women,Karl Schaffer's show about the lives, struggle, and work of important woment mathematicians, was performed in February, 2012 in Santa Cruz. Article in the Santa Cruz Good Times on Daughters of Hypatia show. Europe, Summer 2010. The reconceived arrangement of our concert “The Secret Life of Squares,” featuring Saki, Karl, and Erik, at the Bobita Puppet Theatre, July 25, was one of the main theatrical events at the Bridges 2010 conference in Pecs, Hungary, and was part of the European Capital Cities of Culture Festival. Our performance mirrored this conference’s focus on the connections between mathematics and the arts, and conference participants and general public packed the theater, standing room only. Hungarian television and press covered the concert and, judging by the audience response, it was an overwhelming success. Karl and Erik also performed a duet show at Constructionism 2010, in Paris I mid-August. This show was also very well received. Karl and Erik led workshops on math and dance at both conferences. Enthusiastic conference participants from Asia and Europe have inquired about possible performances, and negotiations are beginning for the 2011-12 season. We’ll keep you posted. To our many donors and supporters, Thank You! Recently published article: Karl and Erik's pioneering and ongoing math dance was featured in an article in Dance Teacher Magazine in the March, 2010 issue. Video excerpts of Dr. Schaffer and Mr. Stern Dance Ensemble works are now at YouTube. July 24-28, Bridges 2010, in Pecs, Hungary. Aug. 16-20, Constructionism 2010, in Paris, France. Donations are always welcome. Please send to MoveSpeakSpin, PO Box 8055, Santa Cruz, CA 95061; donations are tax deductible. Photos of Ronn Reinberg, long-time tech director, advisor, and friend to Dr. Schaffer and Mr. Stern. Kennedy Center Partners in Education program. Karl and Erik continue as Teaching Artists presenting math dance workshops for educators and students through this national arts integration program. Recent workshops have been given in Newark; Richmond, Virginia; Birmingham, Alabama; Madison, Wisconsin; Columbus, Ohio; Birmingham; Tennessee; Buffalo, NY; NYC. Puerto Rico. Both Erik and Karl taught many workshops for teachers, students and artists in Puerto Rico in April and August, 2009, as part of a National Endowment for the Arts grant. They found the children, teachers, and artists they worked with extremely excited by the math dance work in this follow-up trip to their 2005 residency. The residency was sponsored by the Instituto de Cultura Puertoriquenna. Choreography for Ririe-Woodbury Dance Company. Erik choreographed a new work that premiered in RW's September 2009 concert "Equilibrium." "Unlikely Ritual" is a short fractured look at the strange self-designations men and women are asked to give themselves when filling out dating and compatibility forms. at SJDancCo's ChoreoProject Awards, Feb. 19 and 20. Karl is featured in "Cool Careers in Math," a new booklet designed to interest teenagers in mathematics, recently published by Sally Ride Science. He and Saki, Fabricio Olsson, and Deanna Ross performed for the San Jose Children's Discovery Museum's Legacy for Children Award 2010, honoring Physicist/Astronaut Sally Ride on Friday, May 14. Math Dance with Dr. Schaffer and Mr. Stern, published in October, 2001, was written by Karl Schaffer, Erik Stern, and Scott Kim, of the The Dr. Schaffer & Mr. Stern Dance Ensemble. Just as current medical research represents the cutting edge of conception and treatment of dementia, the creators of Demolition Derby view the project as a means to engage, entertain and create awareness through artistic expression. The Dr. Schaffer and Mr. Stern Dance Ensemble performs under the auspices of MoveSpeakSpin, a non-profit, tax-exempt organization. Please make your tax deductible contribution using the form below.